Enjoy life in this truly unique farmhouse from the 16th century on the hills over-viewing Lucca. Relax in the faithfully restored wine-cellar or enjoy the Tuscan sun next to the pool in a beautiful rose garden. All amenities are available for your comfort: private swimming pool (36ftx18ft-12mtx6mt), satellite TV, DVD, stereo, WIFI(house WiFi and portable WiFi), wood fireplace and grill, dishwasher and washing-machine. Maid service, Cooking service, Babysitting, and Cooking lessons available. The farmhouse sits on its own 16acres olive-growth. 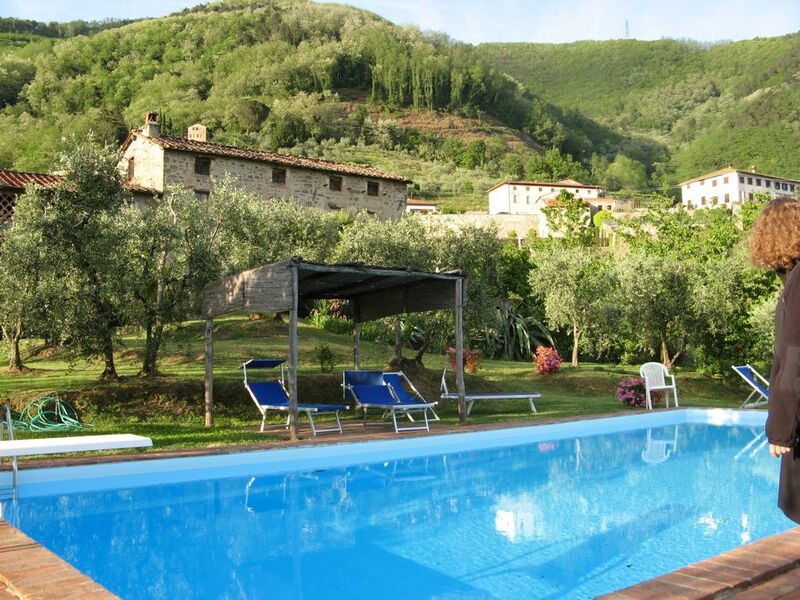 It is very private and yet 20 minutes from Lucca, 40min. from Pisa, 45min. from Florence, 1hr. from Cinque Terre and Porto Fino, all destinations are reachable via train. Many other short day trips can expose you and your company to ancient history, adventure, and nature (the Mediterranean see and Apuane Alps are 30min. away). The villa is walking distance from the village and great home-style restaurants. I inherited the property from my father. I have continued to take care of the 500 plus olive trees and make extra virgin olive oil for my family and guests. I love taking care of my house and my tree and I love sharing all this with my guests. You can stay the entire time on the property without ever missing going out due to the breathtaking views from the outside dinner table, the pool, the house and the amazing walk on the property and beyond. WiFi in the house is fast and reliable I also give you a Portable WiFi for when you are outside the house. The refrigerator is large and it has different compartments from veggies temperature to freezer. Stove has four burners and an elongated electrical grill. Double oven: one larger and one smaller. Both ovens are convectional. Large pool: 12mt x 6mt or 36ft. x 18ft. Maid Service, Private chef and baby-sitting are available on site, optional. We visited this beautiful property in early July and were very happy with the house, amenities, and surroundings. One of the best surprises was that both the sunrise and sunset are visible from inside the house and from the patio and pool. The interior of the house is restored with great attention to details. There is a breathtaking view over the valley below that includes the moonrise behind the hills in the evening. During the day we enjoyed the warm sun and dips in the pool, as well as the cooler air inside the house. Our kids had a good time renting bikes and riding up the mountain roads, walking for pizza at the local restaurant, swimming at any time of day or night, and playing tag among the olive trees. It was easy to drive to Lucca for shopping and strolling. Highly recommended. Three friends and I spent 7 wonderful days at this wonderful Villa in the quaint and ancient town of Matraia. The description was completely accurate and the pictures do not justify the beauty of this special villa. The house itself is magnificently preserved with 16th century beams, huge wine barrels and even the original paint color of the walls such as turquoise blues and peach. Although the kitchen has a cozy fireplace with views of the grand size pool and Lucca beyond, we ended up spending most of our time in the relaxing and breathtaking wine cellar lounge area. Outside we spent many a night swimming under the stars and having great food and wine under the canopy overlooking Lucca. During the day we took our road bikes right from the front door and explored the many small towns and churches in the mountains of Martraia including the original town of Pinocchio. Other days, we took day trips to the beach, Florence, Lucca and Cinque Terre that are all easily accessible. We have referred several friends since our stay and all fell in love with the magic of Gianello. Lucca is renown for its history as well as its closeness to high mountains and the Mediterranean sea. At crucial geographical crossroads, Lucca had a significant role at all times in history. Well known to Julius-Ceasar, vital for the traveling of pilgrims to Rome from France, Lucca always fought successfully for its independence. The intact walls around the city offer you a magical bike stroll and, give you a perspective of what is to come once you emmerge in its historical roads. The character of this small city is well preserved by the absence of cars and its lively atmosphere; from open markets to the same cafés where Giacomo Puccini would spend afternoons with his illustrious friends. Lucca is famous for its leather-shoes shops and great Tuscan cuisine. The villa is surrounded by other historical villas from the 14th century on, which are open for visits. However, if you prefer, you can explore wilder itineraries, and stop at exquisite home-style restaurants. Cancellations: I do my best to accommodate guests who need to cancel. Refunds are dependent on my ability to rebook the time originally reserved. More details are in the rental agreement. Cooking service is available and rates varies according to type of service. Baby-sitting is available at $15.00 per hour.